A couple of new and exciting projects have popped up that are interrupting my progress in Noah’s Art Camp (luckily, those of us who are currently enrolled will have free access when the course resets in November), so I figured in the meantime I’d post a little bit about printmaking. I’m only going to talk about the three printing techniques I am personally familiar with – screenprinting, lithography, and woodcut. The Traveller, screenprint/mixed media, 2011. I’ll talk about screenprinting first, because it’s the printing technique I am the worst at! It requires a heck of a lot of precision and – as a result of that – patience. In screenprinting, a mesh fabric is stretched over a frame, much like canvas, and your image is created on the fabric through which ink is squeegeed onto your printing surface, be it paper, fabric, or some other material. The effect is basically a big stencil. When you have multi-layered designs, things get…interesting. You have to line up your layers VERY precisely, because if your alignment is off by even a fraction of an inch, you’ll get a sloppy-looking print and there’s not much you can do to recover it (to my knowledge). This is why machines are used in a lot of commercial screenprinting – less margin of error. A printing press is not required for this technique, making it easy-ish to do at home which is why it’s so popular. Because I am a sloppy-as-all-getout screenprinter, I ended up augmenting my prints with line-drawing over top. If you’re a screenprinter, you might be shaking your head at me right now, but hey…the result is pretty cool! 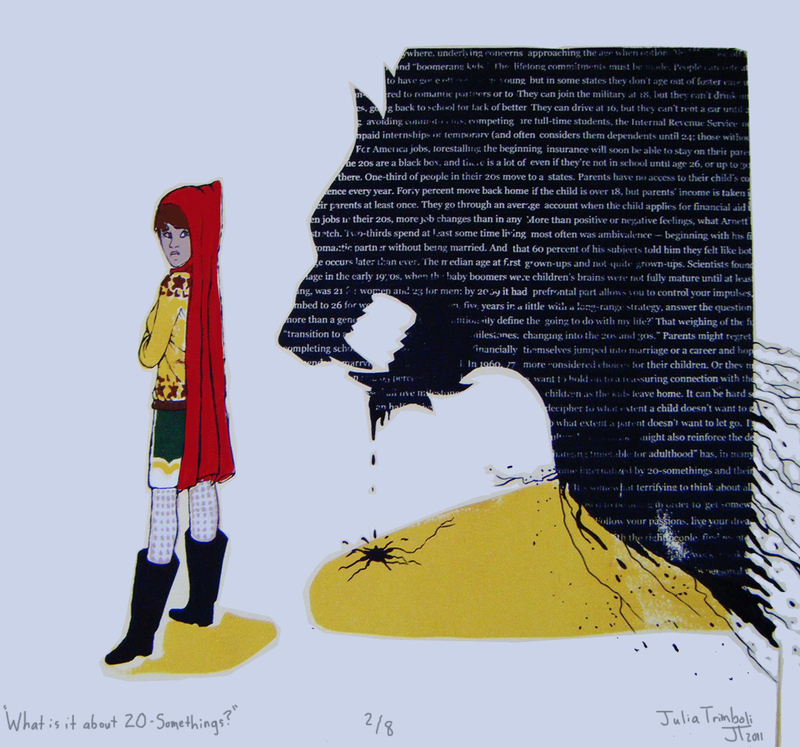 What is it about 20-Somethings?, screenprint/mixed media, 2011. Next up is a technique that is becoming somewhat endangered – lithography. This technique makes use of the natural repulsion of water and oil. Your image is drawn onto a limestone block with grease, then ‘etched’ using an acidic medium that burns the image onto the surface of the stone. A water-soluble substance like gum arabic is then applied to seal the blank parts of the stone’s surface. Your stone is wetted, rolled with ink, and put through a press – and bam! You have a print. And if you followed the steps correctly, the water repelled the ink from the printing stone’s surface, except conveniently for your etched image! Unfortunately, limestone quarries around the world are drying up (metaphorically speaking), which has driven up the price of limestone blocks, but I imagine printing co-ops give members access to blocks. I left my personal favorite technique for last…woodcut prints! This technique may seem easier than the previous two, but the results are often extremely impressive. If you can think way back to your high school art class, you may recall your teacher handing you a linoleum block and a cutting tool and having you make a big rubber stencil out of it. Woodcut, also known as ‘relief printing’, is pretty much like that. You draw your image directly onto a wooden (or linoleum) block’s surface, carve away the areas that you don’t want to receive ink, thoroughly cover the surface of the block with ink using a brayer, then run your block and paper through a press. This technique requires you to think about your design as a ‘negative’ image, which can be confusing. Basic woodcut blocks can be used to print many times. 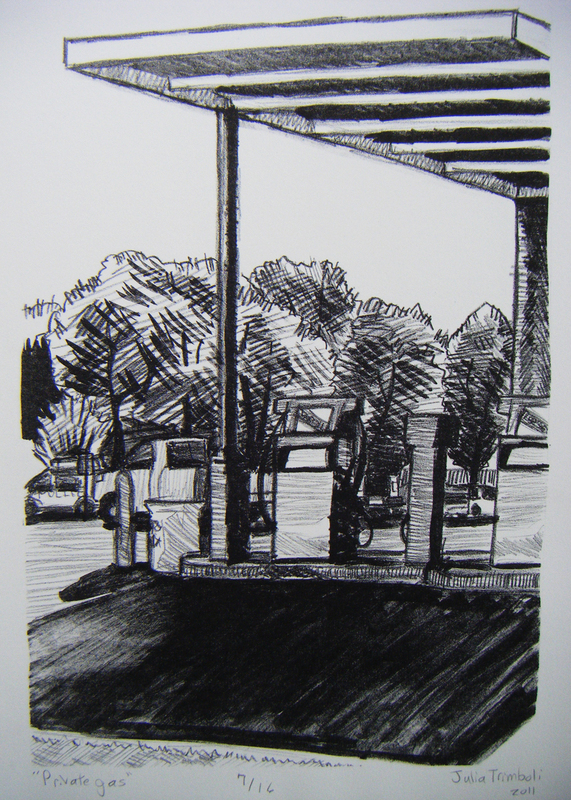 Sunny Day Downtown, woodcut print, 2011. If you read the previous paragraph and thought to yourself, ‘I got this!’, try reduction printing for an added level of difficulty – and beauty. Reduction printing involves carving progressively more of your block surface away to achieve different colored layers to your prints, all using the same block. Again with the precision! The major downside here is that once an area of your image has been carved away to print a successive layer, you obviously can’t go backward. All in all, I think printmaking is a rewarding process and has produced a lot of incredibly detailed and original work from a great number of classical and contemporary artists. If you want to give printmaking a shot, there are printing co-ops in many major cities where you can take lessons and pay a fee for studio/print press access. If that sounds a little too intimidating, Michaels sells printmaking kits and supplies!